-Roast pince nuts at 400 degrees for 1 minute. -Place the chopped eggplant, yellow/red peppers, red onion and garlic on two rimmed cookie sheets. Toss with olive oil, salt and pepper. Roast at 450 degrees for 20 minutes, flipping periodicallly. -Cook orzo pasta in vegetable or chicken stock according to box directions. Drain and stir to prevent sticking. 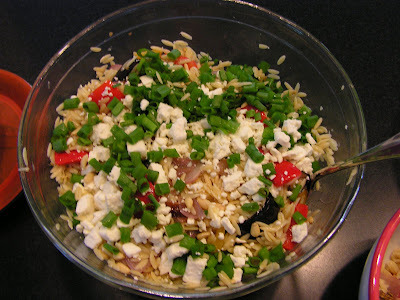 -Combine orzo and roasted veggies and let cool. -For dressing, combine 1/3 cup olive oil, juice of 2 lemons, salt and pepper to taste. Pour over orzo and veggies. -Top salad with scallions, roasted pine nuts, feta, and fresh basil. Serve. Bake cookies according to package. Cool, then frost each cookie. Cut fruit into small pieces. 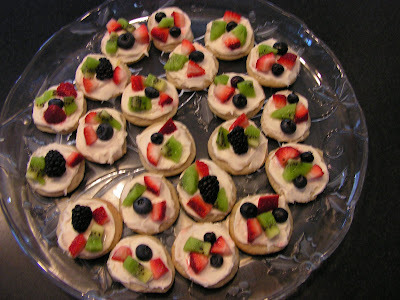 Arrange several types of fruit on each cookie.